Artist Manager Camy McArdle has left Spalding Entertainment after 15 years with the company. McArdle can be reached at 615-300-6768 or here. The 40th Annual Music City Tennis Invitational 2013 recently presented $73,000 to the Center for Child Development at Monroe Carell Jr. Children’s Hospital at Vanderbilt. Since 1973, the Annual Music City Tennis Invitational has raised over $1.5 million for Children’s Hospital at Vanderbilt from MCTI tournament player registrations, corporate sponsors, donors and songwriter showcases. 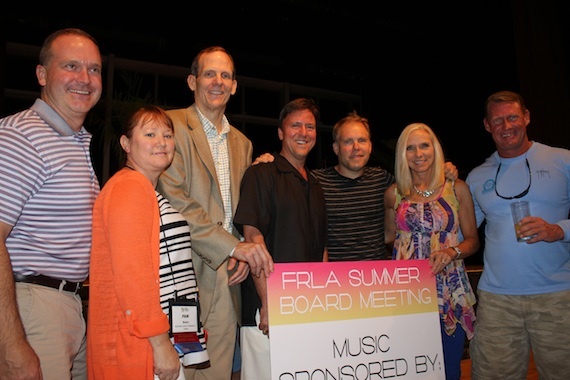 The Florida Restaurant and Lodging Association held their summer board meeting recently in Boca Raton, Fla. During the meeting, the state’s top restaurateurs and hoteliers were treated to a performance by BMI Nashville songwriter Danny Myrick. Myrick played a number of his popular songs including the Jason Aldean hit “She’s Country” and his Top 10 song “International Harvester” recorded by Craig Morgan. Pictured (L-R): Hilton Fort Lauderdale Managing Director Kevin Speidel, Wyndham-Tampa Bay GM Pam Avery, BMI’s Dan Spears, Incoming FRLA Chairman and Ritz Carlton-Amelia Island GM Jim McManemon, Danny Myrick, FRLA President & CEO Carol Dover and Tradewinds Island Resorts President Keith Overton. Black River‘s Director of National Promotion, Bill Lubitz, married Amy Lewis on Saturday (June 22). They were wed at the Las Vegas JW Marriott.